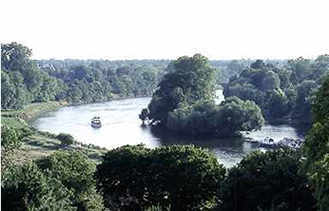 A river, particularly one as well-worn as the Thames, is like a favourite shoe. The leather of the banks has been moulded by centuries of human use, working with the motion of the water through its course. The culture of the river is the cumulative stories of the settlements on its edge, the fords and ferries across its stream and the gods which control its floods and droughts. A river through a city is an idea, an image in the minds of its citizens. Somewhere in the back of our minds lurk stories of druids, Romans and Saxons – a burning London Bridge; Shakespeare and bear pits at the Globe; Handel and Jean Michel Jarre doing things with water music and light effects; Jack the Ripper and smog; imperial fleets and the D-Day flotilla; docks and warehouses replaced by dealing rooms, penthouses and waste land. And then there are the more special local stories and associations – be they in Erith, Greenwich, Southwark, Chelsea, Kew or Hampton. Each of the small towns along the river, which combine to make London, has its own particular character, culture and identity. At one level culture is history. It is the past as we choose to remember it – the stories selected, handed down and enshrined in buildings, anecdotes and the names of streets, quays, steps and pubs. The history of each area contributes to the genius of that place. And the way that each place has been settled, farmed, developed and polluted determines the plants, birds and fish which survive on the river’s banks. Ecology can be as exposing as archaeology in revealing a place’s past. Culture lives and changes. The people who actually inhabit a place carry and create the culture. It is the contemporary memory which decides the history selected. Today’s interpretation gives the old stories their latest spin. And it is the present life, lived along and beside the river, which makes it the place it is. Londoners and Thames dwellers tend to have an affection for the river’s history and a vivid imagination sparked by the well-worn character of the river banks. But the frenzy of contemporary life; the divide between north and south; the social and political battles; the personal associations and the latest supermarket about to spring up on one¹s school playing fields, bring an immediacy to the sense of the place and the culture of the riverside. So can a strategy for the river respond to something as elusive and ephemeral as culture? How can culture be incorporated into planning systems if it is at once all-encompassing and yet individual; pervasive and yet hard to pin down; a compendium of past experiences and yet constantly changing? Perhaps the first step is to stop and listen. Trying to understand the culture and character of a place is a good start. It may not lead to conservation. The new developments will still proceed and the old ways of earning a living will change. But in the pause of delving into the lives which have gone before and the ideas which bubble up now, there is a chance that the next development may be inspired by the spirit of the place and in turn inspire the people who live within it. 3. A long-term plan and vision for the river environment which crosses borough boundaries and integrates into the planning system an awareness and sensitivity to the fine eccentricities of local character set in the broader riverside pattern.